I am lucky enough to make a part of my living reading tarot. In the past I worked at Amazon.com. I started in the warehouse and eventually ended up being a jewelry buyer, but left the company because of visions and ethical concerns relating to my job’s environmental and socio-economic impact. I never had any idea I would later be practicing divination as a trade. 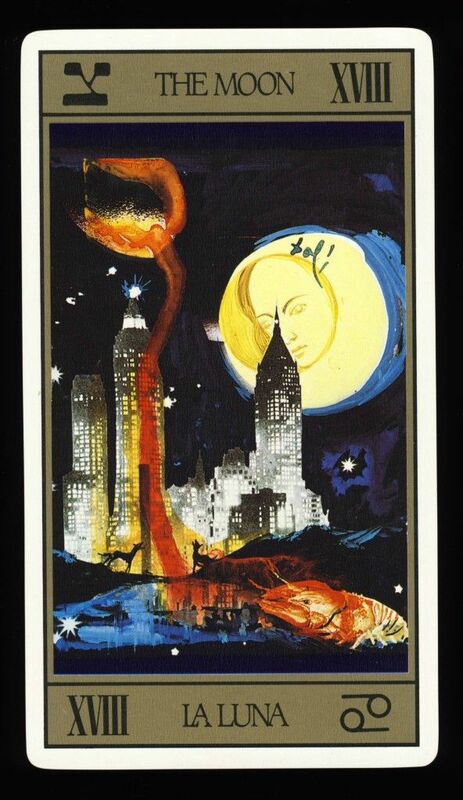 Interestingly, there is NOT a lot on the internet about how to best begin with tarot! So this is meant to help fill that void. A lot of people think a tarot deck has to come to you as a gift. That’s a good way to receive a deck, especially in the symbolism of being handed down something. It’s also much more special if it’s someone you trust, a good friend, someone who understands you. Really, the most significant aspect of finding your deck should be that the process is not generic or mundane. There should be a story behind it, even if it’s just a small one. There should be a feeling of otherness, mysticism, — something uncanny about the process. It should feel as if you and that particular deck were fated to be together. Coincidences may abound. Or there might be a lot of steps taken till you find the right deck. And it’s totally okay to buy your own deck! For instance: maybe you are visiting a new city and got lost. You start to not care about being lost and wander down a side street. Literally following your nose, you find a tiny shop that smells of sandalwood and dragon’s blood (a type of plant resin). The shop sell incense, daggers, occult books and tarot decks. The store clerk looks like a conjuration from some dimension of faery and djinn, with icy eyes and tattooed hands. You ask to look at the individual cards for some of the decks and are naturally drawn to a particular set from Italy. It is a final printing. You decide to buy the deck with money that came from a $50 tip you received this morning, from an elderly native of India who taught you the sanskrit word “brahman”, which means “to grow.” If it wasn’t for that tip, you wouldn’t be able to afford this deck. Everything feels right. You think the cards are beautiful. You take them home with you. I found my Thoth deck by going to Salem, Massachusetts and wandering through the fog to the edge of a pier, and finding this little occult shop there. I’d been looking at the Thoth deck but never liked the color levels of the other printings, and also was thrilled at the over-sized dimensions, which makes it easier to display the cards on an altar and use individual cards as a talisman. The next thing to figure out, after acquiring a deck, is where you will keep your new cards. You should find some silk. There’s this idea that silk is an insulator, and the “vibes” around whatever is enclosed in this material will be kept pure and unaffected by what is outside of it. This is a belief based on an old tradition. I’m going to digress for a second about a huge topic, belief. You do not have to believe that silk is a magical insulator, or about any of the other things in this post relating to an acceptance of a tradition. You could argue that is is superstition. You could also say, by radical extension, that the alphabet is just comprised of shapes and don’t have to have certain sounds associated with it. I personally do not mind accepting and believing certain things that would seemingly break apart with an rational level of analysis, because I understand that to function as a human being I have to become entangled in its structures, its belief systems. As long as I am aware that reality is dependent on the consciousness of the observer, and I understand my consciousness is made in part by belief systems, illusory and filtered by cultural background, personal character, and past experience, and as long as I never concretize and become ego-dogmatic about such things, then if the belief seems to work in my life I feel free to do as I will. Tarot decks often come in a cardboard box. Unless you really think the box is special, get rid of it, or at least keep it somewhere else. It likely has the distribution and printer information, and is not very magical. Also, some of the cards might not actually be a part of the 78 cards. Besides the silk, you might also want to put your cards in a special handmade box, or on a special stand of some sort. Treat your cards as sacred objects. Put them on an altar or somewhere special, and don’t leave them out in a place where they won’t be appreciated or could possibly be mishandled. The next step is learning the cards. Here you generally have three possible sources of information: direct teaching from someone who reads tarot or teaches classes, books, and the internet. The main thing is to not be dogmatic about what any one particular person says about the cards. You don’t want to be a repeating machine. What books are best? See the bottom of this post for a list. Some books are more esoteric, or requiring understanding of certain “secret” or enigmatic symbols and concepts in order to understand. If you are not already an occultist, it’s actually okay to get these types of books, even if you don’t understand what they are saying. Eventually you will. You will start piecing things together. That’s why this is occult knowledge. The piecing together, the immersion in mystery and the conscious and subconscious tie-ins that happen over time is part of what makes a book “occult” (latin “occultus, meaning “hidden”). It’s not meant to be handed down to you on a plate. Eventually you may learn what 2=9 means, or that symbol for saturn, or what the third decan is and how it relates to that particular card. But if at first you simply have general attributions to connect with the cards, that’s okay. To begin you have to take a first step, and it won’t be far from what what you already know. As for the internet, google away, look at numerous links, same rules apply. How to read? That topic is out of the scope for this essay, but I can go into this a little bit. First thing is to read the card simply by looking at picture and surmising for yourself what the card is telling you. Figure it out. If you have a Ace or a One of Wands, what is your guess about what that might mean? Sometimes the picture itself will give you a lot of info. Then look in the book. What you will eventually become proficient at is perceiving several meanings of the card at the same time, almost as if you are looking through a kind of looking glass, and all the symbols and impressions and words from things you’ve read, your intuition, and your experience from past readings are floating in front of you. Here is an important piece of advice, and one that I find a lot of beginning tarot readers miss out on: read the individual cards, but also read them in context with the other cards, and read the patterns that show up with several cards. Figure out why cards show up that are similar or opposite of others, and learn to read the cards as a story, i.e. this card leads to that card because of that card, which leads to that goal or truth. That book, while being “fiction”, is rich with wisdom about how divination works. It’s important to determine your own interpretation — it might be the same as the book you are using as reference, but go with whatever makes sense to you in the context of the question. Do readings about yourself first, and then about external situations and other people. (Don’t be one of those obnoxious readers who feels the need to share their divinations with everyone). Eventually, start doing readings for other people! I don’t want to overstate this, but you may find certain coincidences and synchronicity between readings. For example, the cards may completely affirm the truth about the situation in an astonishing way. Or they will state a truth that there is no way you could have known. Or they will repeat, in multiple spreads, the same card in the same position, over and over, defying chance. A journal is a necessity. Write down your readings, including your descriptions of what each card means. When you’re learning tarot, something that can be helpful is looking at what you decided the card meant in a past spread, and also seeing where the card showed up before. Look for patterns. Get obsessed, do it a little too much. Seems like the people who are the best at something are often that way simply because they spent a lot of time doing it. The Rider Waite Tarot, The Thoth Tarot, Deviant Moon, The Morgan Greer Tarot, the Golden Tarot, and the Aquarian Tarot. The decks that I have in my personal collection: The Thoth Tarot, The Book of Kaos Tarot, The Dali Universal Tarot Deck, Fabio Listrani’s Night Sun Tarot, the Nefertari Deck, and The Book of Azathoth.